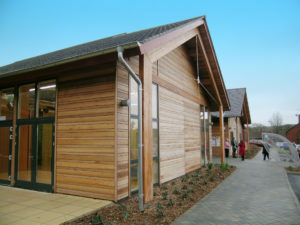 The Building provides conferencing and training facilities, taking the form of a large open plan Hall with additional private Office space for teaching and training. The external wall panels were constructed using a 184mm frame with the internals a combination of 184 & 89mm. The main Hall was formed using visual grade glulam stability frames restrained using steel tensions bars, these frames continued externally using a change in specification to larch. The roof to the Hall was constructed using loose cut rafters supported from the glulam frames, whereas the office space incorporated pre-fabricated trusses to provide a flat ceiling throughout. Single storey restaurant to create open plan seating area with kitchen and ancillaries to the rear. The external wall panels were constructed using a 140mm faceted frame to form the sub-structure to the curved facade. Internally are visual grade circular glulam columns supporting steel beams above, loose cut rafters were used to complete the external envelope. 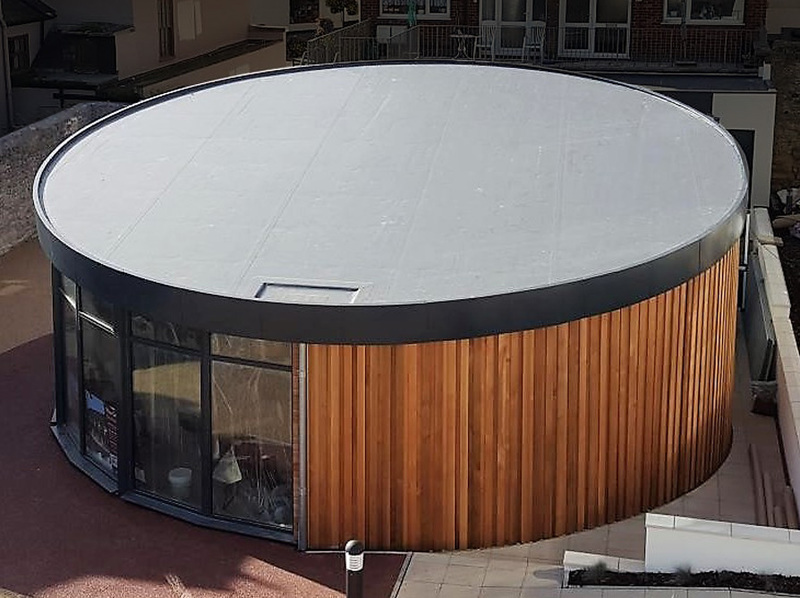 Due to the circular foot print and shallow pitched roof an oval shaped roof was required, this was constructed using faceted steel beams to the eaves above the large glazed areas below. The flat roof to the kitchen and ancillaries was constructed using softwood joists with a timber deck above.